You are starting to sell products online or in person and someone has said, "What are you going to do about sales tax?" 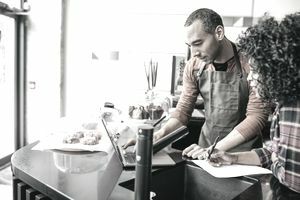 These tips will help you make decisions to come up with sales tax software that will help you collect, report, and pay sales taxes now and as your business grows. What products or services will I be selling? Are they subject to sales tax? Will I be selling online, in person, or both? If you are selling in person figuring sales taxes are pretty simple and you may not need complicated software (more on that below). Will I be selling only in the U.S., or internationally? If you are selling online, you can decide whether you want to take international transactions. To sell internationally, you'll need a specific type of software or application to handle international taxes. Will I be selling online through an online site like Amazon, eBay, or Etsy? Your situation may be as an affiliate, a specific situation relating to sales tax. These sites may have some help for you in figuring and paying sales tax. If you are considering an FBA (Fulfillment by Amazon) relationship, that's a complex sales tax situation. Will you be shipping or gift wrapping products? Some states charge sales tax on shipping and gift wrapping. How much will I be selling? Pricing for sales tax software is based on the number of transactions or number of products. Make a guess for the short-term for right now. Spend some time evaluating your current selling situation so you know what features and levels of software you will need. Report and pay those taxes collected at the appropriate time. You can see why sales tax software is so valuable. It's almost impossible to know sales tax rates in all these taxing entities. If you are selling locally in just one location, you may be able to use a simple calculation app like Ecwid. If you are selling through your own online site to multiple states, you'll need a full-service sales tax program like TaxJar, Avalara, or Taxify. These programs include sales tax reports and payment modules. Of course, your first question should be about support. How is support handled? Is it person-to-person by phone (the best way for beginners)? Does your software know which products are taxable and tax-exempt in the states where you are selling? What additional sales tax categories do they have? If you need to have sales tax calculated on shipping and gift wrapping, for example, make sure the software can do that. How often do they update their databases? Sales tax amounts and regulations change all the time. Your software should be able to keep up. Do they file sales tax returns and payments to all taxing entities? Can the software handle real-time transactions? Does your software handle sales tax holidays? Many states have sales tax holidays when transactions are not taxable for a week or two; your sales tax software should be able to account for this. Does this software connect to your bank's merchant account, your shopping cart, or applications like Amazon or eBay? Will I need a tech person to set this up? How easy is it to use this software? You may be wondering if your current business accounting software could handle these sales tax transactions. Software like QuickBooks might be able to handle simple sales tax situations. If you are doing Amazon FBA or your sales tax situation is more complicated, your software may not be able to handle it. Ask how often your software company updates its databases. If you have a CPA doing your accounting, they probably won't be able to help you with sales taxes. But it's worth asking. As your business grows, your list of products and services will grow. You will have more transactions, you may be selling to more locations, and everything will get more complex. Most online sales tax software applications have different levels of pricing that you move up to. Most of these apps also can go month-to-month as well as annually. Month-to-month might be best until you see if you like the program. Then you could switch to annual pricing when you are happy with the software.